His Excellency Global Community Potentate Nicolae Carpathia is back, this time as Satan. Resurrected and indwelt by the devil himself, the beast tightens his grip as ruler of the world. Terror comes to believers in Greece as they are among the first to face a GC loyalty mark application site. The gloves are off, as the forces of good and evil begin a battle for the very souls of men and women around the globe. A repackage of the eighth book in the New York Times best-selling Left Behind series. 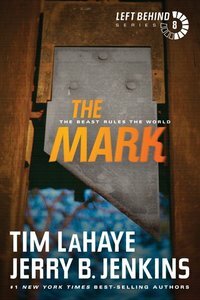 About "The Mark (#08 in Left Behind Series)"
Dr. Tim LaHaye is the creator and co-author of the Left Behind series and is also a noted scholar of Biblical prophecy, an internationally known author, a minister, and an educator. He is the founder and president of Tim LaHaye Ministries. Dr. LaHaye and his wife, Beverly, live in southern California. Jerry B. Jenkins, former Vice President for Publishing and currently Writer-at-Large for the Moody Bible Institute of Chicago, is the author of more than 150 books, including the best-selling Left Behind series. Sixteen of his books have reached the New York Times best-seller list and have also appeared on the USA Today, Publishers Weekly and Wall Street Journal best-seller lists. Desecration, book #9 in the Left Behind series was the best-selling novel in America in 2001. Also the former editor of Moody Magazine, his writing has appeared in dozens of Christian periodicals.His non-fiction includes as-told-to biographies of such notable men as Bill Gaither. He helped Dr. Billy Graham with his memoirs, Just As I Am, also a New York Times best seller. Jerry owns Jenkins Entertainment, a filmmaking company in Los Angeles, which produced the critically-acclaimed movie Hometown Legend based on his book of the same name. Jerry Jenkins also owns the Christian Writers Guild, which aims to train tomorrow's professional Christian writers.Under Jerry's leadership, the Guild is steadily expanding its services to include a writers' advocacy centre, college credit courses, a critique service, literary registration services, and writing contests. As a marriage and family author and speaker, Jenkins has been a frequent guest on Dr. James Dobson's Focus On the Family radio program.Jerry and his wife Dianna have three grown sons and three grandchildren. - Publisher. As the world's thousands of believers gather in Jerusalem for a stadium rally, the Tribulation Force struggles with their own personal crises. Newspaper reporter Buck Williams and his wife, Chloe, question whether or not they should have a child when the future of the world is so uncertain. Meanwhile, Rayford Steele discovers the shocking truth about his wife, Amanda. Nicolae Carpathia continues his rise to power, forcing believers underground. But Nicolae isn't prepared for a plague of scorpion-like locusts tormenting his followers?? ?with a pain so horrible that men try to kill themselves but aren't allowed to die. A repackage of the fifth book in the New York Times best-selling Left Behind series. Order now to secure your copy when our stock arrives. Other edition is available. 9781414334943 0 Available. Expected to ship in 6 to 7 weeks from Australia. The fifth exciting title in the bestselling LEFT BEHIND series of apocalyptic novels will fascinate and captivate newcomers and fans alike. It is the most shocking portrayal yet in the continuing drama of those left behind after the Rapture. 403 pages, from Tyndale.